Is the OHA next to experience public wrath over executive bonuses? It seems there are two choices with regards to executive compensation. The first is to simply place executives on salary and expect them to do the job they get paid for. That’s how rank and file employees get paid. The second is to divide compensation, setting out a certain amount as “base” salary, the rest as bonus based on established performance benchmarks. The Local Health Integration Networks can also claw back a percentage of a hospital CEOs salary if the hospital fails to live up to the terms of its accountability agreement with the LHIN – not that we are aware of this ever taking place. The LHINs themselves may be a bit gun-shy about using these powers given they themselves are struggling to meet their own performance targets. The Erie-St. Clair LHIN, for example, missed 11 of 14 performance targets for 2010-11. The media have been on a feeding frenzy today around Tuesday’s disclosure of hospital executive compensation packages. Like the sunshine list, it is a chance for the private sector to paint a picture about how the public sector has been wining and dining on the taxes of the downtrodden, even if it is less than true. The real story is there are really no big revelations here. The most shocking example we found appears to be the work of sloppy reporting rather than executive excess. The Toronto Star reported that Dr. Robert Howard, CEO of St. Michael’s Hospital, was receiving “a $75,000 allowance for a car.” This would lead most people to believe Howard was getting $75,000 each year to apply to a lease or purchase of a vehicle. In fact, had the reporters been a bit more careful, they might have figured out that it was for a lease or equivalent for a car whose retail value was up to $75,000. Nice, but at this level, ho-hum. This week OHA CEO Tom Closson wrote to a number of groups opposing the recent “hospital secrecy law” (Schedule 15 of Bill 173) that will allow the Ontario Hospitals to shield specific quality information from the public. Given Schedule 15 had alredy been amended — presumably to the OHA’s approval — it is questionable as to the purpose of Closson’s sudden enthusiasm for letter writing. The actual amendment passed at the legislature’s finance and economic affairs committee Thursday morning. What is most surprising from Closson’s letter-writing is his accusations that public interest groups were attempting to “grossly mislead” the public about the meaning of the Bill. The letters, all posted the OHA’s website, manage to insult the community organizations in a way we haven’t quite seen before. If these submissions were full of factual errors and misleading commentary, one might understand. Closson’s rebuttals fail to point out much in the way of factual error, but instead revisits the OHA’s original argumentation around the need for the schedule and takes issue with some of the intervenor’s interpretation of the role of the Quality of Care Information Act. To suggest on this basis that anybody is trying to “grossly mislead” is a bit much. It also calls into question the OHA’s attitude towards public engagement. By any interpretation, the government has opened the door to hospital transparency, and closed it to a degree with this amendment to the Freedom of Information and Protection of Privacy legislation. That’s a fact. Closson is not the only one getting in on the act of incivility. We could be wrong, but some hospitals may take umbrage to their characterization as children who got straightened out by the LHIN. It’s been a long cold and wet spring. Here’s hoping that with a bit of better weather we can all go back to debating health care policy without this kind of nasty rancour. Oh, and Tom – no need to reply. 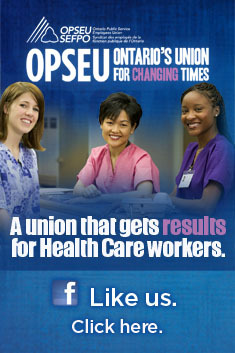 Hospitals are to be subject to Freedom of Information beginning January 2012. “I sued in frustration as a last resort, so that the truth would be told in the death of my father. Unfortunately, that has yet to happen. I wanted, and am still actively seeking, accountability, justice and transparency in the Ontario health care system in its entirety, and access to information that, in a democracy, must be available to the public. “Imagine our surprise when a question was put forward regarding schedule 15 and our honourable health minister said that this was added for patient safety. In our opinion, schedule 15 does just the opposite. Patient security and privacy is already covered by the Personal Health Information Protection Act. “RNAO agrees there is a need for protecting the identity of hospital staff when engaged in quality-of-care discussions, as the threat of disciplinary proceedings could indeed hamstring such discussions. On the other hand, it would not inspire great confidence in the hospital or the health care system if hospitals refused to release quality information for fear of litigation. Conspicuous by its absence was the Ontario Hospital Association and the Ontario Medical Association, which had lobbied for the exemption alongside a major malpractice insurance company.